Just the other day we were looking around for a venue in Everton Park to hold community events and we immediately thought of the cottage located in Fallon Park behind the library. The building has served many community roles over the years and seemed ideal for our purpose. We found to our dismay, however, that it has been declared unsafe and access to it restricted. Signage at the site shows the building to be Fallon Cottage and by repute it’s one of the oldest buildings in the suburb so we decided to find out more about it. A deep dive into the local history section at the library was the first avenue I tried. I spent a happy morning delving through the files of historical material held by the library and discovered many interesting things about our suburb. The most surprising of these is the fact that, while Fallon Cottage is very old, it has been going under the wrong name for quite some time and should really be known as Poultney’s Cottage. The story behind Poultney’s Cottage came to light in a document compiled by the Heritage Unit of the Brisbane City Council which I found tucked into the back of a folder of clippings about McDowall. 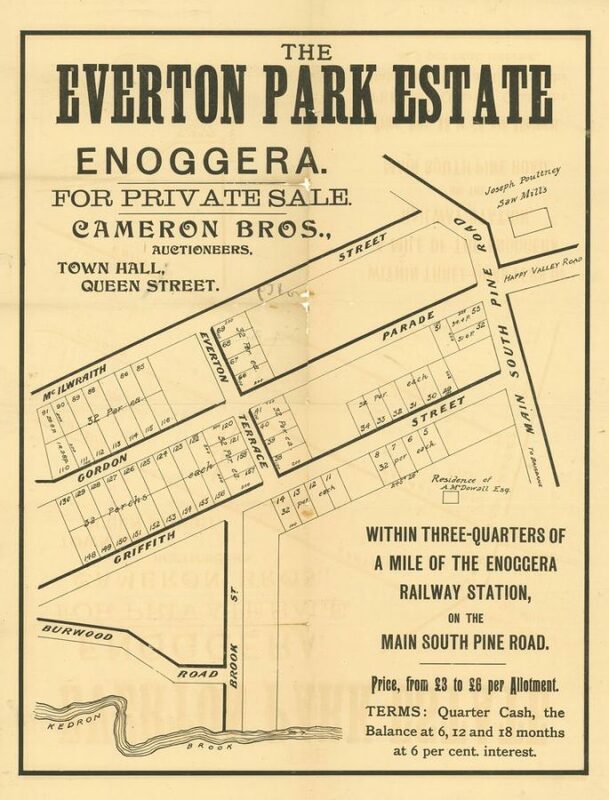 It seems that Joseph Poultney was one of the original settlers in the Everton Park area and bought the land on the corner of South Pine Road and Happy Valley Road (now Stafford Road) for £43 2s. 6d. He later used the land, where Everton Park Shopping Centre now stands, to build a sawmill in the 1860s and which employed 200 people at its peak. The cottage is thought to have been built in the 1870s which would definitely make it the oldest building in the area. 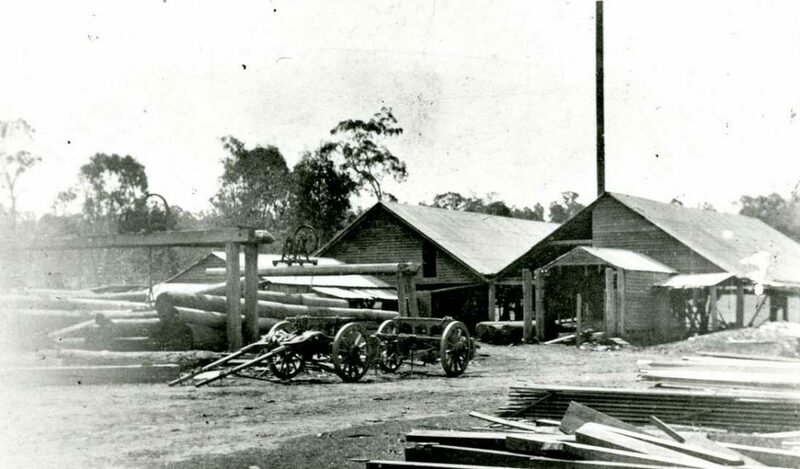 Joseph Poultney’s Sawmill situated at the location of Everton Park Shopping Centre – date unknown. The cottage fronted onto South Pine Road and may initially have housed the whole family while a larger house was built next door. In any event, the cottage and the land it stood on was made over Joseph’s son George, who worked at a variety of occupations, including shopkeeper, and was active in a variety of community roles. The Heritage Unit’s report closes with the fact the block of land and house was bought by Mary Jane Bennett in 1916. The larger Poultney home burned down in 1988 leaving the cottage alone on its block of land. 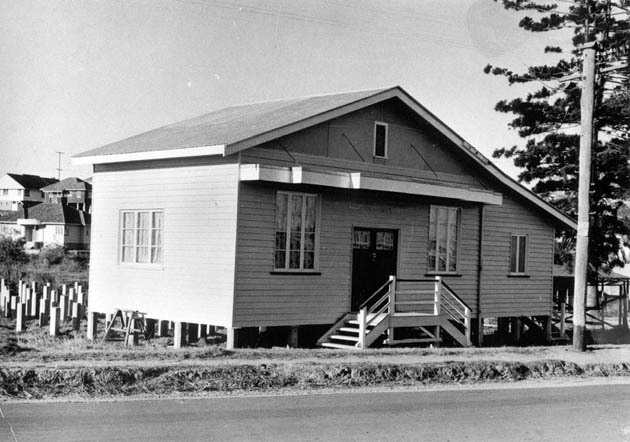 From a picture in the Brisbane Library’s collection we know that the cottage, known as Poultney’s Cottage, served as the Everton Park Child & Baby Clinic in the 1960s. Poultney’s Cottage is shown here in use as the Everton Park Child & Baby Clinic sometime in the 1960s, prior to its removal to Fallon Park. The library files then revealed a clipping from the North-West News dated 18/12/1992 which said the house (cottage) was moved from its location in South Pine Road to make way for a block of units. The move only took 20 minutes and Poultney’s Cottage was safely relocated on council land in Fallon Park. After the move, the cottage must gradually have become known as Fallon Cottage as memories faded. I did not find any trace of a Fallon on lists of the early settlers but an H. Fallon certainly did own the land on which the park is located. I’m as certain as I can be that Fallon didn’t have a role in building the cottage which now sits on land they once owned. I reckon it’s high time Poultney’s Cottage was recognised as such and, hopefully, restored to a safe condition for us all to enjoy as a community venue. Tell us about your property and what you would like to achieve with your property sale – one of our agents will prepare your report right away.